This Edifice stainless steel bracelet watch features a sporty chronograph-like design and incorporates Casio's Tough Solar technology allowing this watch to convert not only sunlight but light from flourescent lamps and other sources into power, this watch will never need a new battery. 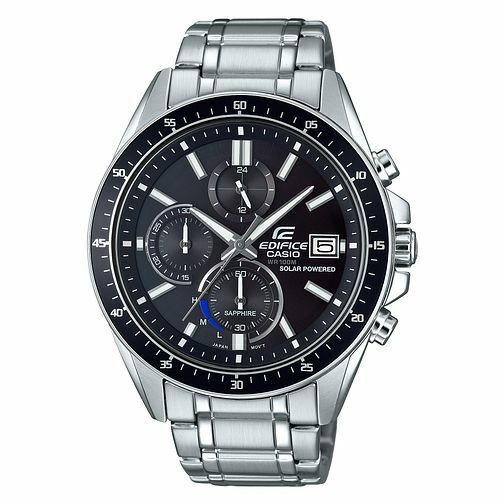 Casio Edifice Men's Solar Powered Steel Bracelet Watch is rated 5.0 out of 5 by 2. Rated 5 out of 5 by Anonymous from Beautifu and elegant watch. A man must have. Bought this watch for my husband and he is so pleased. Rated 5 out of 5 by Anonymous from Amazing present for me The watch is fabulous, I got it as a present for my bday. The most elegant watch I have ever had!